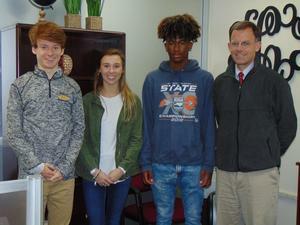 Congratulations to the Pamlico County High School Cross Country Team for having received second place in the Eastern Regional Competition. Additionally, the following student-athletes received honors during the competition: Jahmere Miller placed first overall; Cooper Metts placed second overall; and, Cameron Lee placed third overall in the women’s event. These three students, along with their coach, Paul Delamar, III, were recognized and congratulated during the February meeting of the Pamlico County Board of Education. Pictured: (l-r): Cooper Metts, Cameron Lee, Jahmere Miller and Coach Delamar.